When the real life story of the Chilean miners trapped for months in a cave went international, there was no doubt that this would turn into a movie. 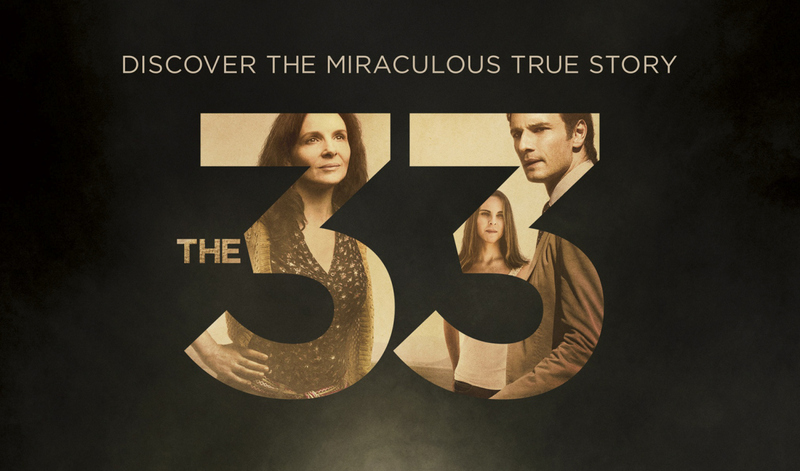 Patricia Riggen does the story justice in “The 33”. The movie is shown from two perspectives, those inside the cave, and those outside of it. As the title suggests the story is about 33 Chilean miners that get trapped mile deep inside a cave. Mario (Antonio Banderas) is the handpicked leader of the men down under. He’s the voice of reason. Amid panic and chaos, Mario is the calming rational voice that is in under control of the limited food supply. On the outside Maria (Juliette Binoche) is the driving force in pressuring the government to continue the search. The link between the trapped miners and the families fighting to get them back is government representative Laurence Golborne (Rodrigo Santoro), who looks like the lost twin of actor Oliver Martinez. Unless you’ve been trapped in a cave, the coverage of this story has been featured all over the news and the story ending has been revealed. The interest in the movie lies in the characters. While all of the 33 miners aren’t prominently featured in the movie, there are a handful that are introduced. The distinction between their personas is what keeps things intriguing in a dull and dark cave. Aside from Banderas character being the main featured one, Lou Diamond Phillips plays Don Lucho, Mario Casas is Alex Vega, the soon-to-be father and youngest of the miners. Binoche is the rock of the movie. She’s the emotional force. Antonio Banderas gives one of his better performances in years. For someone that seemingly has been fading away from the big screen, he re-establishes his presence in this film. “The 33” is a pleasing movie about a scary situation. The performances as very good, and credit Riggen for making the movie version of the story compelling. It’s unimaginable what these men had to go through, and it’s remarkable that they overcame the odds. It’s a feel good story that plays good on film, but it’s more than that. It’s a look at how difficult and scary the mining profession is. The struggle people have to make a living in countries like Chile. Ultimately it’s the families that matter the most, it’s the bond and love they have for each other. The 33 men were brothers when they went in and till the very end of the 69 days they were trapped in the cave, and this movie smartly centers around that concept.